There’s new capability to specify status reason transitions for the Case record type (entity) or custom record types. For Microsoft Dynamics CRM Online organizations, this feature is available if you’ve applied product updates for CRM Online Spring ’14, or if you’ve installed the CRM Online 2015 Update. For on-premises CRM organizations, this feature is available if you’ve installed CRM 2013 Service Pack 1, or if you’ve updated to CRM 2015. If you’re in charge of incident management for an organization, it’s important to provide a simple model for customer service representatives responsible for entering and updating case status. In CRM, there are two fields that work together to provide information about case status: the Status field and the Status Reason field. The Status field for the Case record type has three possible values: Active, Resolved, or Canceled. The Status Reason field stores a reason for a specific status value. For example, for a case with an Active status, a status reason could be In Progress, On Hold, Waiting for Details, or Researching. Big organisations often have a large number of combinations for the Status and Status Reason fields. This can make it difficult for customer service reps to choose the correct next status reason. You can define status reason transitions to add another level of filtering for what the status reason value can be changed to for each status reason. Limiting these values to just allowed status reasons can help customer service representatives make the right choices. In the solution explorer, in the left navigation pane, expand Entities, expand the Case entity, and then double-click or tap Fields. Go to the second page of fields, and then open the statuscode (Status Reason of Case) field. In the Field: Status Reason dialog box, click or tap Edit Status Reason Transitions at the top of the dialog box. 7. In the Status Reason Transitions dialog box, under New Status Reasons, click or tap one of the Enter Value buttons corresponding with one of the existing status reasons. In the Select Status Reason dialog box, in the Available Values list, select the values you want to add, and then click or tap the chevron button to add to the Selected Values list. Click or tap OK when you’re done with that status reason. Click or tap another Enter Value button to modify other status reasons. When you’re done, click or tap OK.
Each status reason option for an active status must allow at least one path to an inactive status. Otherwise, you could create a condition where it would not be possible to resolve or cancel a case. 10. 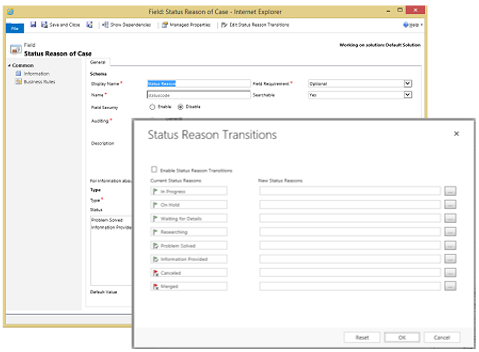 In the Status Reason Transitions dialog box, select the Enable Status Reason Transitions check box to apply the defined status reason transitions to case records. The list of available status reasons will be filtered for each case record based on the defined transitions.